Use typed domain-models to build evolving software. Provide your developers with an unprecedented level of framework integration. Redesign and refactor to evolve your software iteratively and incrementally. 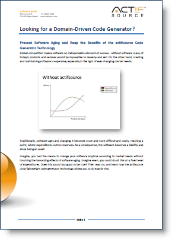 Adapt and evolve your software as need be and turn it into a true asset with Actifsource.